Robert Hartley Cromek, who bought William Blake’s twenty watercolors for Blair’s Grave in the autumn of 1805, was clearly a man of charm, taste, and energy. *↤ I thank Robert Essick for his comments on an early draft of this account. I am also much indebted to the bibliographer of Blake/An Illustrated Quarterly (hereafter cited as Blake) for information and organization of bibliographical details and to the author of Blake Records (2004; hereafter BR) for biographical details. Quotations with dates are from BR(2). “Butlin #” refers to Martin Butlin, The Paintings and Drawings of William Blake (New Haven: Yale University Press, 1981). People readily liked and trusted him; Blake did too. He was also a man of flexible scruples, ready to promise what would serve his commercial purposes. His ilk still flourishes 200 years later. These twenty watercolors were on unwatermarked paper of various sizes, 10.8 to 23.8 cm. wide by 19.6 to 30.2 cm. high (no two are identical)—seven landscape shape, the rest portrait shape—and mounted (by Cromek?) on stiff brownish paper 33.0 × 26.5 cm.1↤ 1. The title page has no framing lines or mount and is the size of the mounts of the other designs. Pastemarks on the backs of many pages suggest that they were once pasted down. No. 16 is on different paper. watermarked RUSE | 1800, J WHATMAN 1801, and J WHATMAN. 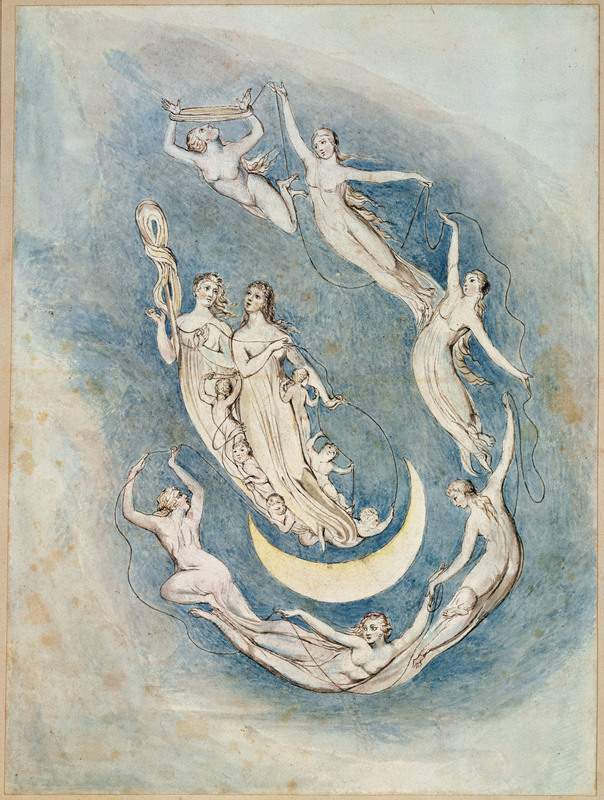 The variety of papers and sizes may imply that the watercolors were made at different times for different purposes and that Blake had conceived the series before Cromek approached him. The series as it existed in November 1805 is unified by three matching framing lines around the watercolors.2↤ 2. “Death Pursuing” (24.7 × 11.4 cm., Butlin #635) was trimmed to the design, probably after 1876 when it was exhibited at the Burlington Fine Arts Club and its dimensions were given as 31.0 × 20.9 cm. Perhaps the trimming removed three framing lines. The twenty drawings Blake sold to Cromek probably consisted of the fifteen listed in Cromek’s first prospectus of November 1805 (nos. 14, 3, 18, “The Widow Embracing Her Husband’s Grave,” 8, 10, 13, 7, 2, 19, “Death Pursuing the Soul,” 11, 6, 9, 4 in Sotheby’s list) plus five more designs never listed for publication (nos. 5, 12, 15-17). Notice that the title page (no. 1) is not included here. There are significant discrepancies between the twenty watercolors Blake sold to Cromek in 1805 and the nineteen offered 200 years later at Sotheby’s in 2006. “The Widow Embracing Her Husband’s Grave,” listed in Cromek’s first prospectus, did not appear in later descriptions of the series, e.g., the second prospectus, also of November 1805; it was separated from the other watercolors and is first traced in 1876 (Butlin). It is now at Yale. “Death Pursuing the Soul through the Avenues of Life,” listed in the first prospectus, disappears from Cromek’s puffs thereafter and was separated from the other Grave designs, perhaps because it was thought to be an “Illustration to ‘Urizen,’” for so Cromek’s son labeled it and Allan Cunningham described it.3↤ 3. Allan Cunningham, “William Blake,” in his Lives of the Most Eminent British Painters, Sculptors, and Architects (1830) par. 18 (BR 638). Cunningham lived with the Cromeks in 1810. It now belongs to Robert Essick. The design for the title page, “The Skeleton Re-Animated,” does not appear at all in the first prospectus (1805). The design is first named in the Manchester Gazette (7 November 1807), where it is called “A skeleton discovering the first symptoms of re-animation”; it appears there as pl. 7, not as the title page. It is much larger than the other designs (33.2 × 26.5 cm.) and lacks the framing lines which unify the others. 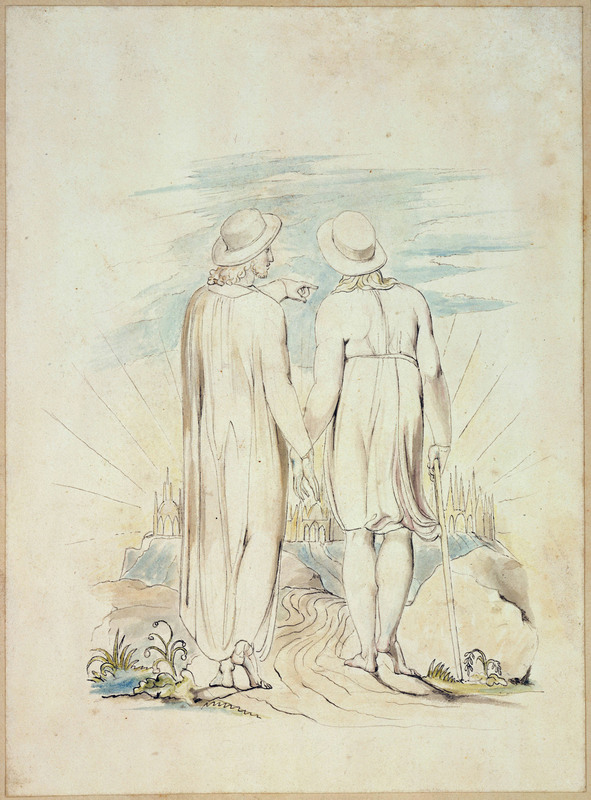 Apparently it was created between November 1805 and November 1807; Blake was still on speaking terms with Cromek as late as April 1807, when he offered his design for the dedication (refused with contumely). Perhaps Cromek traded to Blake “The Widow Embracing,” which he no longer needed, for “The Skeleton Re-Animated,” thus avoiding the need for any tedious transfer of cash. It was apparently only later that “The Skeleton Re-Animated,” was adopted for the title page. Once the watercolors had been engraved, Cromek had no further use for them. 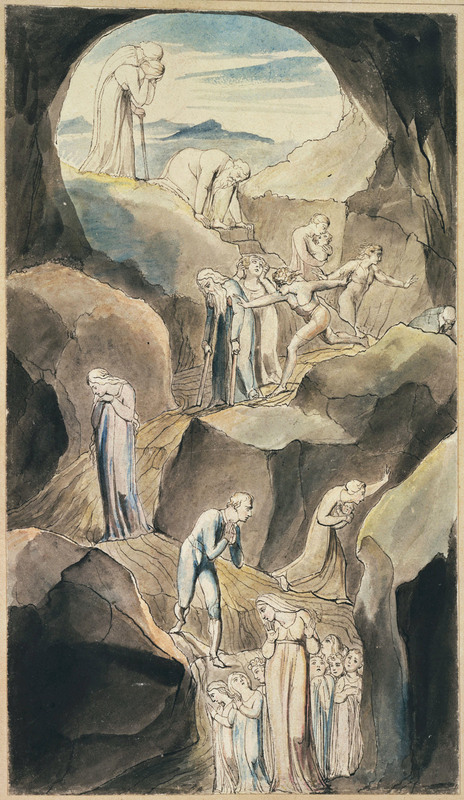 In a letter of May 1807 he offered to sell back to Blake “the 12 [watercolors] for ‘The Grave’ . . . on the publication of the poem . . . [for] the 20 guineas I have paid you.” Had Blake accepted the offer, Cromek would have retained the copyright and the other eight watercolors for nothing. Blake did not accept the offer, and when Cromek died in March 1812 he left his wife and two children in a somewhat fragile financial situation. On 3 February 1813 a friend offered on Mrs. Cromek’s behalf: “Blake’s original Designs for Blair’s Grave with other curious Drawings of his, valued at thirty Pounds and likely to sell for a great deal more if ever the man should die .... Mrs C. is rather urgent for the disposal of them. . . .” This offer was not accepted. Some time after Cromek’s death in 1812, the nineteen loose watercolors for Blair’s Grave were put in a red morocco portfolio (sold with them in 2006) with a buckle and a stamped label: “DESIGNS FOR | BLAIR’S GRAVE”—the lining paper is watermarked BEILBY & KNOTTS 1821. The set of Blair watercolors migrated to the collection of Thomas Sivright of Meggetland, for whose estate they were sold at auction by C. B. Tait of Edinburgh on 10 February 1836, lot 1835, as a “Volume of Drawings by Blake, Illustrative of Blair’s Grave, entitled ‘Black Spirits and White, Blue Spirits and Grey’” (adapted from Macbeth 4.1) for £1.5.0, buyer unknown. This spiritual title is no longer with the watercolors. The drawings then entered their long sleep of 165 years. Alas! it was not Prince Charming who brought them to life once more. During the years of oblivion, the watercolors for Blair’s Grave were in the Stannard family. They went from John Stannard (1794-1882), watercolor artist of Bedfordshire, to his son Henry John Stannard (1840-1920), watercolor artist, then to John’s grandson Henry John Sylvester Stannard (1870-1951), to Henry Lawrence Stannard (1934-2001), and were “given to a relative in 1987” in Glasgow.4↤ 4. This provenance combines Martin Bailey, “From £1,000 to £10 Million in Two Years for Newly Discovered Blake Watercolours,” Art Newspaper May 2003: 42 (which I have seen only online), with Sotheby’s handsome 2006 auction catalogue (William Blake: Designs for Blair’s Grave; catalogue 8262), which identifies Henry Lawrence Stannard but says merely that in 1987 they were given to “a relative.” Apparently over the decades the significance of the drawings was forgotten; after all, if they cost only a little over a shilling apiece in 1836, how important could they be? In the meantime, the prices of Blake’s works leapt upward spectacularly. At a sale at Sotheby’s (New York) almost exactly seven years ago, The First Book of Urizen copy E “fetched . . . over $100,000 per page,” a price which created a sensation even beyond the Blake world. Such prices “encouraged folk to hunt out forgotten family treasures”5↤ 5. Elizabeth B. Bentley, “Urizen in New York City,” Blake 33.1 (summer 1999): 27-30. and bring them to the attention of dealers. At the end of their long sleep, in 2001 Blake’s watercolors for Blair’s Grave were “sold . . . as part of a small family library, to Caledonia Books, a general second-hand bookshop in Glasgow . . . run by Maureen Smillie”6↤ 6. Bailey, “From £1,000 to £10 Million.” where they were offered at £1,000 as colored engravings—though there are nineteen watercolors, not twelve engravings as in the published versions. Apparently the vendors did not look at the published version, available in editions of 1808, 1813, 1826, 1847, 1870, [?1879], 1903, 1906, 1963, 1969, 1973, and 1982. There the portfolio and watercolors were seen and taken on approval for £1,000 (presumably minus the customary dealer’s discount of 20%) by Paul Williams of Fine Books, Ilkley, West Yorkshire, who associated Jeffery Bates of Bates & Hindmarsh, a Leeds bookshop, with the acquisition. They took them for an opinion to Nathan and Dominic Winter of Winter Book Auctions, Swindon, with whom they had dealt before, and the Winters quickly disabused them of the idea that the portfolio contained colored engravings. 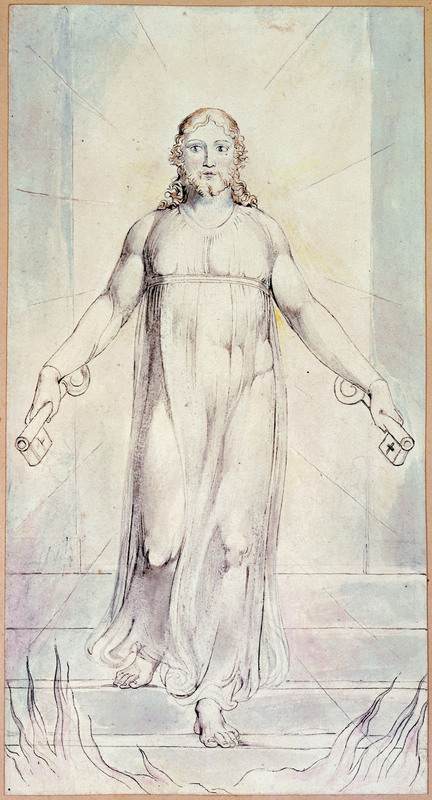 The Winters consulted Martin Butlin, author of the magisterial catalogue raisonné of Blake’s art, formerly of the Tate, and Robin Hamlyn, who is now responsible for the Blakes at the Tate, and were assured that the watercolors were genuine and valuable. Butlin later described them in print as “arguably the most important [Blake discovery] since Blake began to be appreciated in the second half of the nineteenth century.”7↤ 7. Martin Butlin, “New Risen from the Grave: Nineteen Unknown Watercolors by William Blake,” Blake 35.3 (winter 2002-03): 68-73. He wished to sell the drawings en bloc, and the Tate, which naturally was deeply interested in them, was given first refusal for six months at a price, it is said, of £2,000,000 (a nice increase from £1,000), later increased to £4,200,000 (plus £700,000 tax). If the drawings could not be sold as a group, they were to be auctioned individually by the Winters in London. On 17 December 2001 Nathan and Dominic Winter brought the watercolors from a bank vault to the very elegant Regency Room of the Westbury Hotel off Bond Street, so that they could be seen by David Bindman, Robert Essick, Edward Maggs, Rosamund A. Paice, Morton Paley, John Windle, G. E. Bentley, Jr., and E. B. Bentley. All these were immediately impressed by their authenticity, beauty, importance, and commercial value. For a time the offer to the Tate was suspended while Caledonia Books sued Paul Williams and Jeffery Bates for return of the watercolors and £15,000 damages; on 22 November 2002 the suit was settled out of court (so no public record is available), but the parties are said to have agreed on the sale of the watercolors and the equal division of the proceeds.8↤ 8. Carol Vogel, “Art Experts Protest Sale of Rare Set of Blakes,” New York Times 16 February 2006: E1, E7. The speculative buyers, even if they relinquished half of their profits to the Glasgow shop, would have to be content with a gain of only £2,000,000. As soon as the lawsuit was settled, and before the Tate could act, in December 20029↤ 9. The date is given in the Sotheby’s catalogue. the London dealer Libby Howie “snuck in and bought them” for about £4,900,000, according to Sir Nicholas Serota, director of the Tate.10↤ 10. Vogel, “Art Experts.” Serota described the breakup of the set as “heartbreaking” (Vogel, “Rare Watercolor Collection Auctioned Piece by Piece,” New York Times 3 May 2006: B5). She gave the impression, at least to Sir Nicholas, that she was buying on behalf of a hitherto unknown private collector who was variously identified as an American with a castle in Scotland who would make them publicly available and “Marburg BVI,” a Swiss corporation.11↤ 11. According to Bailey, “Dealer’s Decision to Break Up William Blake Album Branded ‘philistine,’” Art Newspaper online, 16 March 2006, this is “a family trust registered in the British Virgin Islands and . . . the Blakes were to be delivered to the freeport at Geneva airport.” The Sotheby’s catalogue describes the owner as “a European based private collector.” The British reviewing committee on the export of works of art (see below) was told that the “new owner was prepared to allow access to scholars and to consider their eventual exhibition and publication,” but we know of no such access or exhibition in the last four years, except for the sale. There is of course a distinction between being “prepared” to do something and doing it. The export of the drawings was stopped by the British arts minister, Estelle Morris, until 30 May, later extended to 30 September 2005, because of the “serious intention to acquire the paintings by the Tate”; they were valued at £8,800,000 in the reviewing committee report of 16 March 2005. The watercolors were presumably sent to Switzerland, as requested in the application for export. The discovery, and particularly the export ban, generated very wide publicity in journals and newspapers from London to Winston-Salem and Kansas City and Kerala. Most of the authors were anonymous, but those named included Alexander Gourlay and Martin Butlin.12↤ 12. Butlin, “New Risen from the Grave”; Alexander S. Gourlay, “‘Friendship,’ Love, and Sympathy in Blake’s Grave Illustrations,” Blake 37.3 (winter 2003-04): 100-04. However, it later appeared that Howie had bought them as a commercial speculation for a congery of investors not necessarily interested in art. She attempted to find a buyer for several years before concluding “that no museum would be interested in buying the set” (Vogel, “Art Experts”). This is a Cromek-like statement, since the Tate was attempting to raise money when she abruptly bought them. Eventually they were offered at Sotheby’s in New York on 2 May 2006, a sale in which the watercolors for Blair’s Grave were the only works on offer. To stimulate interest, they were exhibited in London, Paris, Los Angeles, Chicago, and New York, but the Los Angeles exhibition (the only one about which I have information) was sparsely attended. The target, of course, was not the many-headed public, but serious collectors, such as Alan Parker in London, the Amis du Louvre in Paris, Robert Essick in Los Angeles, the Rothmans in Chicago, and Maurice Sendak in New York. The catalogue itself is very handsome, a collector’s treasure, with printing in red and black, color reproductions of all the lots for sale, half of them “actual size,” and hard covers imitating the portfolio in which the drawings were found. The catalogue, by Nancy Bialler, is also remarkably responsible, partly because of the assistance throughout of Robert Essick, with reproductions of the more important of the analogous drawings and a careful history of the enterprise. It must be unusual for one of the auction-catalogue contributors to be an eager bidder for what is described. £8,800,000 estimate in the reviewing committee report for 16 March 200513↤ 13. Robert Essick, “Blake in the Marketplace, 2005,” Blake 39.4 (spring 2006): 154. Before the sale, possible bidders for individual watercolors included the anonymous US owners of America (R), Book of Thel (H), First Book of Urizen (E), Songs of Innocence (H, N), and Songs of Innocence and of Experience (D), and other works (already contacted by Libby Howie about buying the whole collection); Leon Black, who has two splendid Blake watercolors; Robert Essick, whose major Blake collection includes two other watercolors for Blair’s Grave, “Death Pursuing” (Butlin #635) and “Churchyard Spectres” (Butlin #342); the J. Paul Getty Museum of Los Angeles; the Huntington Library, the most important public Blake repository west of the Mississippi, perhaps in association with the Getty Museum; Alan Parker, owner of the Large Blake-Varley Sketchbook and the Bunyan watercolors, and other works; Maurice Sendak, owner of The First Book of Urizen pl. 3, Songs of Innocence (J), Songs of Innocence and of Experience (H), Hayley, Ballads (1805) colored, Hayley, “Little Tom,” colored, and other works; Tate Britain, the most important collection of Blake’s art; John Windle, the chief dealer in Blake books and drawings for several years; the Wormsley Library of the late Sir Paul Getty; the Yale Centre for British Art, which owns a watercolor for The Grave and a major collection of Blake’s works in illuminated printing, and other works. The chief public repositories of Blake’s drawings and paintings—the British Museum Department of Prints and Drawings, the Fitzwilliam Museum, the Huntington Library, the US National Gallery, and Tate Britain—have not purchased expensive Blake pictures for some time, but it was possible that one of their benefactors might be interested, such as Eugene V. and Clare E. Thaw, whose important “Christ Nailed to the Cross” by Blake is on deposit at and promised to the Pierpont Morgan Library. For one thing, some of the nineteen watercolors are likely to return to the oblivion from which they suffered for 165 begin page 69 | ↑ back to top years. For another, when they are scattered it will no longer be possible to compare the original drawings directly with one another. The paper and dimensions and watermarks can of course be recorded, but it will be exceedingly difficult to ascertain whether, say, the blue in one watercolor is exactly the same as that in another watercolor. Martin Butlin’s observation that the watercolors which were engraved seem to be more sun-faded than the ones never engraved will be almost impossible to make with confidence when the drawings are widely dispersed. An analogous situation occurred thirty years ago with The Book of Urizen—and with a very different result. About 1956 Paul Mellon bought Urizen copy A with twenty-eight plates. Then, in 1971, copy C with twenty-six plates was sold for £24,000 and acquired by a consortium headed by Mellon’s occasional agent John Baskett. When the consortium found that they could not sell Urizen (C) at a thumping profit as readily as they had hoped, they let it be known that they would sell the twenty-six plates separately, as the copy was “incomplete,” “missing” two plates. Faced with this threat, Mellon bought Urizen copy C in 1972, thus becoming the only collector in history to own two of the eight copies of Urizen. Alas, all the knights in shining armor in 2006 seem to have shallow pockets. Sotheby’s New York is now in a building at least ten stories high with whole floors devoted to particular genres; the Blake watercolors were exhibited on the floor with impressionists, post-impressionists, and modern art. On the same floor were Renoirs, Matisses, Chagalls, and Picassos, with massive Maillol statues of clothless females here and there, enough to make famous a museum anywhere in the world. The lighting and setting were superb. The attendants were suited men armed only with discreet lapel buttons. At a private viewing before the sale, arranged by Robert Essick, it became clear that the fine catalogue reproductions were not good enough. The glossy coated faintly-peach-colored paper falsifies the effect significantly, the colors of the originals are generally darker, and there was a consistent muting of the delicate watercolors. Joseph Viscomi assiduously recorded the color shifts so that he could adjust the reproductions which will be used in the William Blake Archive. The drawings are breathtaking, with many details which are barely detectable in the reproductions, such as a crease across “The Grave Personified” and the fact that in “The Soul Hovering over the Body” the eyes of the corpse are still perceptibly open. At a cheerful, bibulous wake of Blake lovers to say goodbye at the graveside for perhaps the last time that the drawings will be visible in their integrity, a sweepstake was organized estimating the total which the drawings would realize at the sale the next day. The participants consisted of scholars (David Bindman, Morris Eaves, Robert Essick, Alexander Gourlay, John Grant, Mary Lynn Johnson, Joseph Viscomi, and Bentley and Bentley), most of whom (save for Bindman and Essick) were pretty innocent of commercial expertise. There were also nervous collectors (Essick, Roger Lipman, Alan Parker), who were dauntingly canny, a dealer (John Windle, who declined to participate on the ground that it would constitute insider trading), an editor (Sarah Jones), and their partners. The estimates ranged from $7,300,000 to $16,900,000, and the irrelevance of extensive knowledge of the subject was vividly demonstrated by the fact that the most accurate estimate ($7,300,000) was made not by a scholar or a collector or an editor but by Maria Fernandez, Viscomi’s partner. The room in which the auction was held was, by comparison with Sotheby’s discreet splendors elsewhere, poky and spartan. There were perhaps 150 bidders and spectators on the floor, with perhaps a score standing against the wall at the side. On the banks of telephones and computers and generally standing by were at least twenty more Sotheby’s employees. Prices at auction are affected by such factors as whether the design was engraved and therefore very well known, by publicity such as exhibiting the watercolors in London, Paris, New York, Los Angeles, and Chicago16↤ 16. The buyers came from each of these cities. and the press stories of the export ban and indignation at breaking up the set, by the extent of the coloring (nos. 1, 13, 18, 19 are only slightly colored), by the novelty of the design—some of the unengraved watercolors are familiar from preliminary studies (e.g., nos. 12 and 15) or from use of the same design for other purposes (e.g., nos. 15 and 16)—by who is bidding—only the more prosperous kind of millionaire can effectively bid against another eager millionaire—and by the design’s meaning, effectiveness, and beauty. The sale began promptly at 10:15 am and finished by 11:20. The auctioneer was very professional, firm, precise, and cool, though not chummy. The Blake contingent mostly sat about the third row, which was a mistake, because it’s very difficult to see from there who is bidding. Bearing such conditions in mind, the prices estimated and realized at the Sotheby’s sale are listed in the table on the following page. The competition began briskly, with twenty-nine bids for no. 1, the title page, running the price from $100,000 to $650,000, $390,000 above the estimate, a price which more than one witness found “astounding.”17↤ 17. Souren Melikian, “Louvre Leads Bidding for Lost Blake Work,” International Herald Tribune 3 May 2006. Lot 2 went from $140,000 to $500,000 in twenty-four bids, also above the higher estimate. For the rest of the lots, however, there were only six or seven bids. The value of the watercolors was seriously overestimated. Despite the drumbeat of publicity and discreet inquiries and exhibitions, fourteen of the watercolors did not reach the lower estimate (nos. 4-5, 7-18), and of these eight were bought in to what must have been the disappointment of the sellers. Two went within their estimates (nos. 3 and 6), and three fetched more than their higher estimates (nos. 1-2, 19). Front cover: Watercolor for “The Descent of Man into the Vale of Death” (framing lines cropped here), later engraved by Schiavonetti, bought in (i.e., unsold) at $480,000. Back cover: “Friendship,” known previous to 2001 only in the reference to it in the first 1805 prospectus, bought for $270,000 by a private collector. ↤ 18. All figures are in thousands of US dollars. ↤ 19. For another list of the buyers, see Bailey and Adam. ↤ * | b | c | d | e | f | g | h | i | j | k | l | *engraved in the 1808 edition ↤ 20. Melikian, “Louvre Leads Bidding” (“a private group of benefactors, including the Société des Amis du Louvre and a collector, Antoine Prat” paid $1,680,000 [including the buyer’s premium] at Sotheby’s [for “Death of the Strong Wicked Man”]). ↤ 21. That is, it did not meet the unpublished reserve price and was not sold. 1* Title page $180-260 $650 +$390 Anon. 6* “The Reunion of the Soul & the Body” $900-1200 $900 Anon. 15 “A Father and Two Children beside an Open Grave” $350-550 $280 −$70 Anon. 17 “Our Time Is Fix’d” (illus. 2) $350-550 $270 −$80 Anon. Of course, these figures do not mean what they appear to mean. The purchaser pays to Sotheby’s a “buyer’s premium” of 20% on bids up to $200,000 “and 12% on any amount in excess of $200,000.” The purchaser also pays a New York tax (8.375%) or a variable “compensating use tax of another state” (about 6%). Purchasers who use an agent will have an agent’s fee of perhaps 10%. Thus, a hammer price of $200,000 might represent a cost to the purchaser of $280,000. The vendor pays a negotiable fee to Sotheby’s, plus the costs of reproductions in the catalogue (fifty-one here) and of exhibiting the works. Of the anonymous buyers, those who secured nos. 1, 3, and 6 were bidding by phone. (One wonders whether all the bidders had seen the originals; at least one had not.) The anonymous man in a bow tie who bought nos. 15 and 17 was, John Windle thinks, a curator or a dealer. Hinrich Sieveking, from Munich, says that he is merely an agent for the owner. Jessie Price (Mrs. H. Charles Price) from Dallas, who obtained “the woman with the wings,” like Sieveking and the Louvre, had apparently never bought a Blake before, and they were therefore unknown quantities in the pre-sale speculation. The Rothmans had rarely appeared on the floor before when purchasing Blakes. John Windle bought for stock the portfolio in which the drawings were found. When one buys something at a merely high price, one can simply put it in one’s pocket and walk out of the room with it, as I did when John Windle bought Marriage (M) for me at Christie’s London in 1997 for £9,000. At the altitudinous level of the Blair watercolors, however, life is not so straightforward. The new owners of the Grave designs had to wait for a fortnight while checks were deposited and cleared. Collecting your purchase is simpler in the financial slums. In 2006 the vendors of the nineteen Grave watercolors sold eleven of them, plus the portfolio, for $6,184,200 ($7,102,640 including the premiums), which is about what they are believed to have paid for them in 2002, viz. £4,900,000. They still have eight watercolors, for which $4,810,000 was offered and rejected at the 2006 sale.22↤ 22. A week after the sale, a London dealer with impressive contacts reported that all the Blair watercolors bought in had been sold. According to another report, “The Day of Judgment,” “Death’s Door,” and “The Soul Hovering over the Body” were sold after the auction, and lots 5, 8, and 12-14 were returned to Libby Howie. Sotheby’s did not respond to our written queries as to what became of the watercolors which were bought in. But let us keep this in perspective. Such prices are small potatoes compared to $2,500,000 paid for a Chagall and $5,000,000 for a Monet, not to mention $95,000,000 for Picasso’s “Dora Maar with a Cat,” which were exhibited on the same floor with the Blakes and were sold the next day for these obscene prices to a previously unknown, Russian-accented buyer frantically waving his paddle at the very back of the room.23↤ 23. Carol Vogel, “Mystery Bidder Spends $95 Million on a Picasso,” New York Times 4 May 2006: B4. The amount by which the Picasso exceeded its low estimate, $44,000,000, was about six times what the entire Blake sale brought. But some of us prefer small potatoes. This is heady, glamorous stuff, mink coats and Bentleys. No Blake collection of watercolors has ever reached such prices. After the sale, triumphant bidders and awestruck observers gathered very agreeably at the back of the hall for “gosh” and “who was the bidder in the bow tie?” (one of them was John Windle). To the delight of several of us, the Rothmans willingly joined the group. Noel Rothman said to Jerry, “I don’t understand the fuss about the breakup of the collection; any real collector will surely show his treasures to any seriously interested scholar.” Amen! It has been a wonderful privilege and joy to see Blake’s watercolors for Blair’s Grave on two occasions. What treasure will emerge from the shadows next?